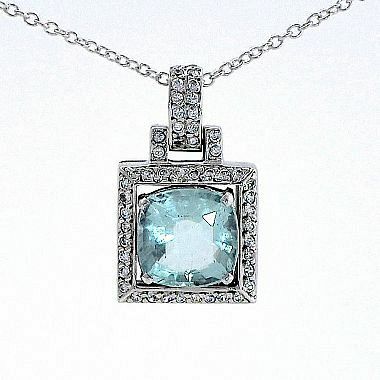 1 x 14ct white gold diamond & aquamarine pendant with an 18ct white gold chain. The 14ct white gold stepped square open work pendant has a cushion cut aquamarine set in its centre in a 4 claw 14ct white gold collet. The stepped drop is suspended from an 18ct white gold chain by an articulated 14ct white gold loop. The loop and the pendant are set with a total of 50 round brilliant and eight cut diamonds.